Subjects Central desert landscapes, Hermannsburg region, MacDonnell Ranges, ghost gum trees and witchetty trees. Ivan Panka grew up at Hermannsburg a Lutheran Mission settlement west of Alice Springs in Central Australia. He attended school in Hermannsburg and was initiated into manhood according to Western Arrente traditional tribal law. Ivan was inspired by the work of his uncle, famous artist Albert Namatjira and his children who were also talented artists. Green, J. 1988, Pmere: Country in Mind, Arrernte Landscape Painters, Tangentyere Council, Alice Springs. Green, J., 1990, 'Country in mind,' Special Double Issue Artlink 10(1&2), 18. Hardy, J., Megaw, J.V.S. and Megaw, M.R. 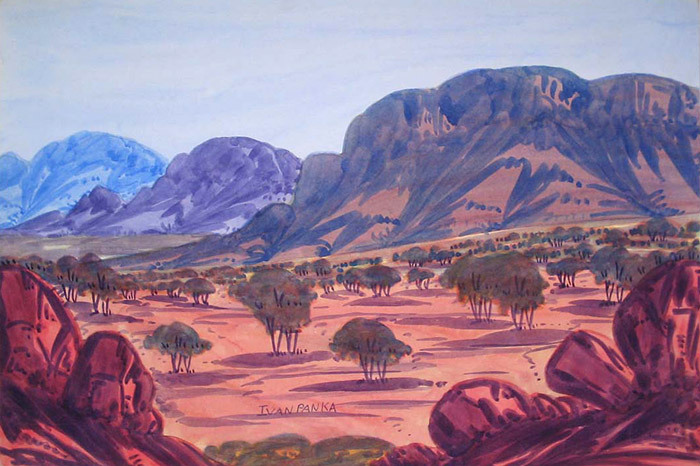 (eds), 1992, The Heritage of Namatjira - the Watercolourists of Central Australia, William Heinemann, Australia.